Gallery of over 2,300 Photos available as Canvas prints, Framed Prints, Acrylic Prints and Greeting Cards. Circa 1895 This view of the Point Pinos Lighthouse near Pacific Grove, Ca. Point Pinos is the oldest, continuously operating lighthouse on the West Coast of the U.S. and has a third order Fresnel lens that was made in France in 1853 the lighthouse was opened on February 1, 1855. In 1879 Robert Louis Stevenson visited the keeper Allen Luce when he was living in Monterey. When this photo was taken Mrs. Emily A. Fish was the keeper from 1893-1914. Holdings: photos of the Lighthouse from the 1870' through today. We have over 85 views of the Pt. Pinos Lighthouse in the Pictorial Collection. We have over 28,000 photos of Monterey County in the photographic collection. 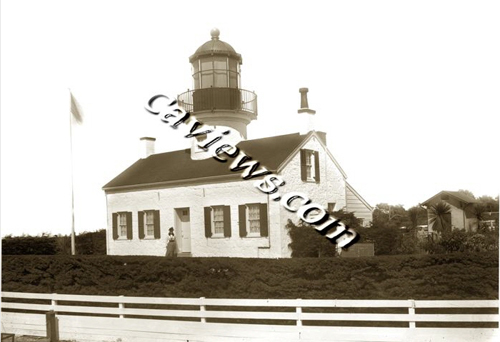 Total number of images, in our database is over 35,000 total We also have photos of Point Sur Lighthstation, Santa Cruz Lighthouse, Piedras Blanco lighthouse, Pigeon Point Lighthouse, Point Bonita Lighthouse with keeper by I.W. Taber, Farallon light station, Trinidad Head Light and Crescent City Lighthouse and other California Lighthouses. Lovers Point Pacific Grove photo gallery. Pacific Grove photos by Pat Hathaway. And California Beach Scenes, passenger liners and Steam Schooners.